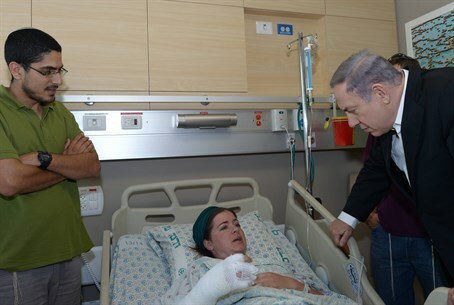 Prime Minister Binyamin Netanyahu on Tuesday afternoon visited 27-year-old Inbar Azrak, who was wounded the night before in an Arab firebomb terrorist attack as she and her husband were driving home from vacation through Jerusalem's eastern Beit Hanina neighborhood. Azrak is receiving treatment at Hadassah Ein Kerem hospital for the first and second-degree burns on 15% of her body that were inflicted in the attack. Her husband Uri was not wounded, although their car was completely burned. Netanyahu visited Azrak at the hospital, where he drew a parallel to the arson attack last Friday at the Arab village of Duma in Samaria that killed an Arab infant named Ali Bawabsha and wounded four family members. "Just a few days ago I visited the brother of the child Ali, who was wounded by a Molotov firebomb thrown at his home by agitators of terror against Arabs," said Netanyahu. "Now I visited Inbar, a young woman who was wounded by a Molotov cocktail that was thrown by an agitator of terror against Jews." While the IDF has indicated Jewish extremists may have been behind the arson in Duma based on the presence of Hebrew graffiti, the identity of the culprits remains unknown and several question marks have been raised concerning the case. The Duma arson was condemned widely by Israeli politicians, whereas the attack against Azrak has been met with a surprising dearth of fanfare. Netanyahu continued in his comparison between the two attacks, saying, "the brother of Ali is a four-year-old boy, Inbar is a young mother to three children aged two, three and four." "Terror is terror is terror," he emphasized. "Our policy is zero tolerance for terrorism, and it doesn't matter where it comes from. We denounce it and fight it to the same degree." Commenting on the unequal response to the two attacks, given the international condemnation of the Duma arson by the US, EU and UN, he said, "I expect that they will join against the same terror that is directed against Jews. I'm still waiting." Netanyahu hinted at the administrative arrest of nationalist activist Meir Ettinger, the grandson of Rabbi Meir Kahane, who was controversially made the target of a potentially endless arrest law for his suspected involvement in "Jewish extremist activity." "I have heard from the margins of our society that there are those who say there is a supreme law above the laws of the state; I want to clarify: there is no law about the laws of the state, the laws of the state apply to everyone and those who breach them, those who espouse hate crimes, those who act with violence, those who encourage terror, we will apply the full weight of the law against them, including when needed administrative arrests, as we did yesterday." From the prime minister's comment, it would appear that Ettinger's opinion that Jewish Torah law should be the law of the Jewish state was a key component in the crackdown against him. No charges of violence were submitted against Ettinger; administrative arrests, a relic of the British mandate commonly used against Arab terrorists, do not require any evidence. "Zero tolerance for terror, that obligates us, that obligates the international community too," claimed Netanyahu.